Here are our best cheap printer deals for 2019, from under £100! All major brands, such as Epson, Brother and Canon, HP - A4 & A3 inkjet, colour laser, mono laser, 3D and all in one multifunction printers. Remember to buy some great value IJT Direct branded printer ink cartridges or toners too. Our offer is simple, buy a few IJT branded ink cartridges and get the printer, absolutely free. Get your free printer today! Looking to buy cheap printers? Buy cheap printers at IJT Direct. We're over 18 years old and have been a reliable printer supplier to home, educational and business printer users, through key initiatives such us our free printer deals. So if you're looking to buy printer, you can't get cheaper than free! We supply printer deals for HP printers, Canon printers, Brother printers, Epson printers and more. What's more you can get your ink cartridges and toner cartridges direct from IJT for some of the cheapest prices available. With top quality service and guarantees. If you need a Canon inkjet printer, buy a cartridge, save by calling IJT now on 0800 083 7447. The best inkjets & toners in Britain. Canon printers, with cheap fast UK shipping! Buy a Canon free printer deal from IJT Direct and you also get replacement Canon ink cartridges covered by a great warranty, cheap and fast UK delivery ensuring you get your new Canon printer and cartridges fast - when you need to print, at low prices. Our Canon printer cartridges are delivered to you with a quality warranty ensure you the cheapest printer buying price, without sacrificing quality. 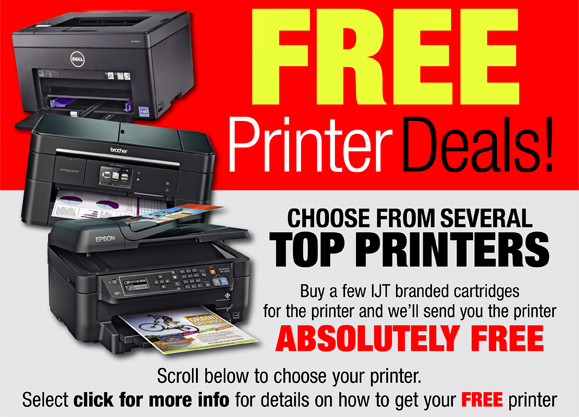 Looking to buy printer deals & free printers? IJT supply printer deals for Epson inkjet printers, Brother multifunction printers, Canon printer scanner copier & fax printers, cheap colour laser printer deals and can also source direct for your requirements. Make us your printer land and buy your ink direct with IJT. All covered by our full 12 month warranty, great customer service and unbeatable value. Why we're the best cheap printer shop for over 18 years! Looking for customer reviews of all cheap printers & printer deals at IJT Direct? Brother toner cartridges, Canon printer ink, cheap Dell toner cartridge, Epson toner cartridges, HP printer ink cartridges, Lexmark ink cartridges, HP laser printing supplies to name a few. View all laser printer models. Or perhaps you are looking for a good quality, low cost mono laser printer? But don't forget, we also sell cheap tablets and cheap mobile phones so it's definitely worth having a look at our online store if you are looking to buy anything printer, ink and gadget technology related.